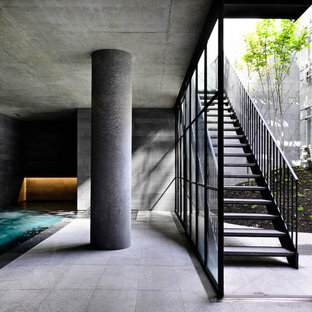 Inspiration for a modern rectangular lap pool in Los Angeles. 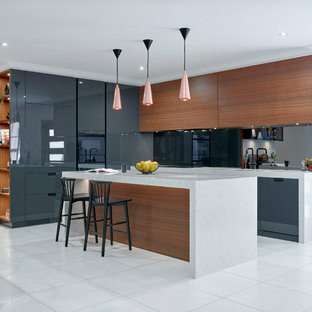 This is an example of a contemporary open plan dining in Perth with ceramic floors and white walls. 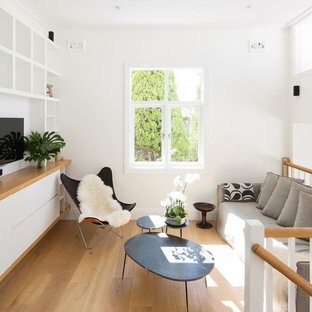 This is an example of a small transitional living room in Sydney with white walls and beige floor. Family Room at JG King Adelphi Home from the Alpha Collection. 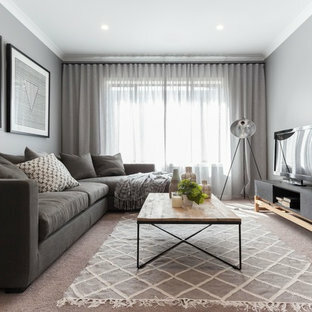 Inspiration for a contemporary enclosed living room in Melbourne with grey walls, carpet, a freestanding tv and beige floor. Design ideas for a beach style loft-style family room in Sydney with white walls, medium hardwood floors, a wall-mounted tv and beige floor. 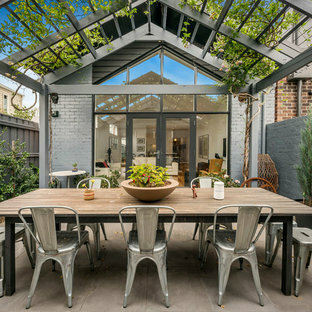 Design ideas for a country backyard patio in Melbourne with concrete slab and a pergola. 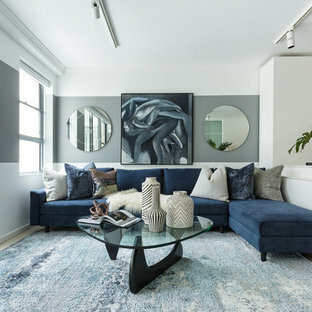 Photo of a contemporary enclosed family room in Sydney with grey walls. This exquisite Hamptons style home was architecturally designed with free flowing space and luxurious details applied throughout. 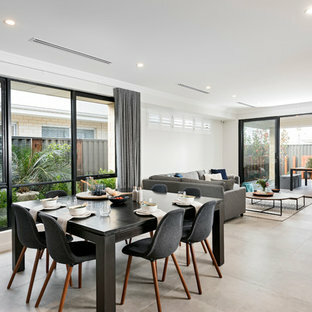 The effortless transition from the open plan interior to the outside garden is seamless, and the use of natural light highlights every perfect finishing in the home. This home exudes the essentials of Hamptons styling where classic sophistication and casual elegance meet a relaxed and comfortable feel. Intrim® SK384 timber skirting boards have been used throughout to enhance the overall look of each room. 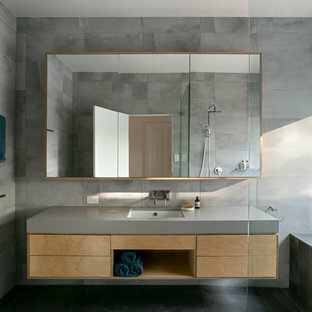 Design ideas for a contemporary master bathroom in Melbourne with flat-panel cabinets, medium wood cabinets, a freestanding tub, gray tile, white tile, grey walls, a vessel sink, concrete benchtops and grey floor. Photo of a contemporary guest bedroom in Melbourne with white walls, carpet and grey floor. 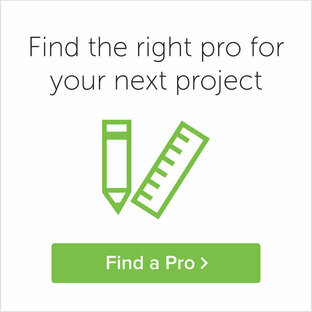 Design ideas for a mid-sized contemporary master bedroom in Melbourne with carpet, grey walls, no fireplace and grey floor. 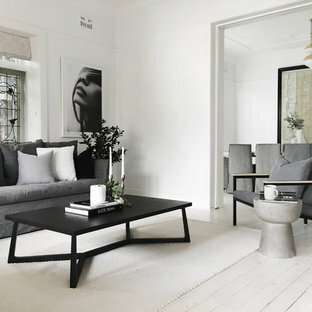 Design ideas for a beach style living room in Perth with grey walls, light hardwood floors, no tv and beige floor. This is an example of a contemporary master bedroom in Sydney with grey walls, carpet and grey floor. Photo of a beach style split-level grey exterior in Perth with mixed siding and a gable roof.